Marlboro Greens in Englishtown, New Jersey is perfect for active retirees looking for affordable homes in a well-maintained neighborhood. This clean and safe community within historic Monmouth County features a beautiful clubhouse with many activities and amenities. Marlboro Greens is a resale community with a total of 341 condominiums and townhomes. Marlboro Greens features lush, tree-lined streets and plentiful amenities for active adults to participate in their favorite activities and hobbies. Residents at Marlboro Greens will also love the convenient location. The community is close to several major roadways and the Garden State Parkway, making quick day trips and visits with friends and family very easy. Active adults looking to enjoy the great outdoors will also love the parks and golf courses that surround the community. The well-designed clubhouse at Marlboro Greens features an exercise room with cardiovascular and strength-training equipment. The clubhouse also features several activity rooms including a card room for hobbyists and arts and crafts groups, as well as a ballroom for planned events and holiday gatherings. There is also a library for discovering your new favorite book with a billiards area for enjoying an afternoon with your neighbors. Outdoors, residents can play tennis, bocce ball, and basketball on the individual courts. There are also shuffleboard courts for friendly games and a sparkling outdoor pool for relaxing during hot summer days. An on-site playground for grandchildren visits round out the outdoor amenities. Adjacent to Marlboro Greens is the 18-hole, par 61 executive-length Pine Brook Golf Course with golf center. Tee times reservations are available to residents after the purchase of a Monmouth County Resident ID. This quiet community was constructed between 1986 and 1988. There are 341 units that include six different models ranging in size from approximately 1,000 to around 1,500 square feet. There are two condominium plans in the community that are 1,080 and 1,332 square feet and have one bedroom, one-and-a-half or two-and-a-half bathrooms, and a one-car garage or an assigned parking spot. Marlboro Greens also offers a selection of townhomes available in four separate floor plans that range in size from approximately 1,200 to 1,500 square feet and have two to three bedrooms, two-and-a-half or three bedrooms, and a one-car garage or an assigned parking space. Some models feature an additional den space or a loft area to use a hobby space. This established community is a popular choice for active adults seeking a simpler lifestyle without giving up comfort and without having to move too far from their families. Neighbors in Marlboro Greens are very friendly and welcome newcomers openly. Residents are active in a variety of social clubs and special interest groups where sports, arts, culture and other subjects are well-represented. Stay active with the bocce club, tennis group, or the group exercises. Get to know your new neighbors with community holiday parties and cookouts. The homeowners' association (HOA) fee covers lawn maintenance and snow removal, allowing residents to live a low-maintenance lifestyle. The low-maintenance lifestyle at Marlboro Greens means that you can enjoy your day however you like, whether its is going on a day trip or taking a leisurely stroll through the community grounds. Marlboro Greens in Englishtown, NJ is centrally situated on Route 9, conveniently located to major roads including I-195, Route 18, Route 33, and the Garden State Parkway. Newark International Airport is about 30 miles away for longer trips. There are also several parks and golf courses only minutes away, including two segments of Henry Hudson Trail wind through Marlboro for walkers and bicyclists. A few miles away, residents can enjoy major shopping at the Freehold Mall. Every summer there are free outdoor concerts by notable popular artists throughout Monmouth County. The sandy beaches of the Jersey Shore are only half an hour away, and New York City can be reached within an hour. 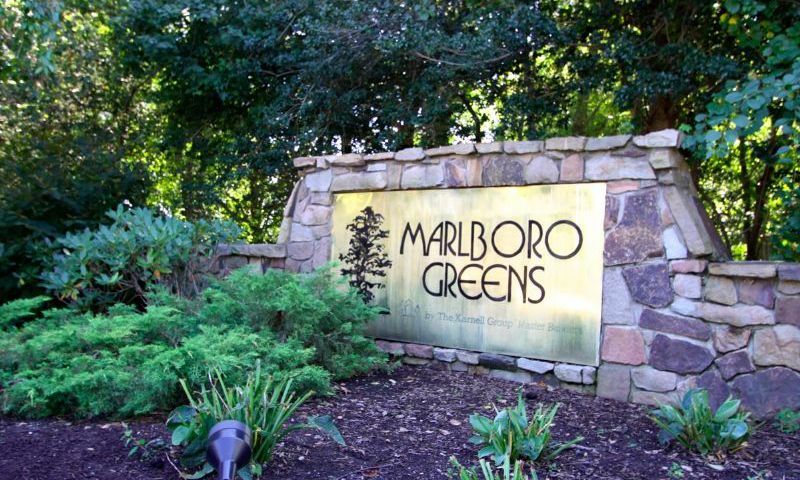 Active adults in Monmouth County, New Jersey will love the lifestyle that Marlboro Greens has to offer. The clubhouse at Marlboro Greens is the centerpiece of the community, where residents come together to enjoy each others' company and take part in community-wide events and clubs. Next door to Marlboro Greens is the Pine Brook Golf Course, and 18-hole par 61 executive length course. The course offers discounted rates for those 65 and better. There are plenty of activities available in Marlboro Greens. Here is a sample of some of the clubs, activities and classes offered here. Marlboro Greens offers condo units in four separate floor plans. These units are 1,080 to 1,332 square feet and have at least one bedroom, one-and-a-half bathrooms, and a garage space or an assigned parking spot for each unit. Marlboro Greens offers four attached home models. These townhomes range from around 1,200 to over 1,500 square feet and have two to three bedrooms, two-and-a-half to three bathrooms, and a one-car garage or an assigned parking spot. Please Note: Floor plans are not available at this time. After 3 years of searching for the right home, I moved in here in February just before the weekly snows...the crews kept the place clean of snow, even working around the clock! The maintenance is superb and the community is kept looking good. I am SO happy here! People are very friendly and it is a very mixed group with people of all ages living here. I am impressed how well kept this community is. Whenever I visit friends who live here there are always seasonal flowers and plants and freshly manicured lawns. In the fall the leaves are cleaned up quickly and after a snowstorm they are diligent about shoveling and salting roads and walkways. I moved into Marlboro Greens on March 28th 2014 after selling my home in East Brunswick. Since I am a widower and live alone the size of the rooms are just fine for me. The property is expertly maintained and the people are friendly and welcoming. Marlboro Greens is very conveniently located to all shopping and restaurants. I am very happy with the choice I made to move into Marlboro Greens. 55places.com is not affiliated with the developer(s) or homeowners association of Marlboro Greens. The information you submit is distributed to a 55places.com Partner Agent, who is a licensed real estate agent. The information regarding Marlboro Greens has not been verified or approved by the developer or homeowners association. Please verify all information prior to purchasing. 55places.com is not responsible for any errors regarding the information displayed on this website.